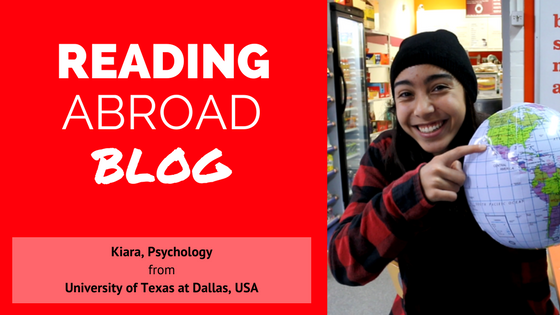 One thing that really surprised me about the whole experience of studying abroad was how welcoming and eager to talk to me people seemed to be in my first few weeks (and for my entire time there for that matter). Even after being there a few days, it became clear to me that most Hoosiers (the name for people from Indiana) have never even met someone from the U.K before. The way I spoke was something out of a movie for most of the people I met, I suppose in the same way most American culture is to me. Upon meeting people, I would receive a quick second-glance at the sound of my voice which would almost certainly be followed by the words “Oh my god, do you have an accent?”, so I mean it literally when I say that I must have heard that sentence at least once a day. I have been using the time in between my studies to see as much of the U.S as I can. I went with friends down to Anderson County in Kentucky where we went bungee jumping, and then the next day went hiking and cliff jumping in Red River Gorge national park. The bungee jump was one the best experiences of my entire life. The 240 foot drop from the platform of a disused train bridge to the Kentucky River beneath induced a feeling of fear, adrenaline and excitement of which it would be hard to come by again. And Red River gorge was an adventure in itself. We spent the day walking along trails in the dense forest underneath the red hot sun, clambering along beautiful rock formations such as what’s known as the Sky Bridge. A natural rock formation of a bridge which the trail leads you over and then takes you back around underneath. Later that day we also came to a part of the river that runs through the national park known as Jump Rock. Here people were swimming in river, which was surprisingly pleasant, and deep enough so that you could jump off a rock around 12 foot above the surface of the water that protruded from the banking. In terms of my studies, the relaxed nature of my lessons has certainly become a little bit more stressful as the pressure starts to build up. Luckily for me my classes are more coursework based as opposed to having exams to take. I really thrive off of the individual and creative nature of my assignments. I have learnt so much practical knowledge about the things that interest me in terms of my professional goals. For example I now know how to fully devise and professionally format a screenplay. And I can utilise the settings of a camera in a creatively enhancing way, whilst also being able to develop my own rolls of film and print the photographs myself in a dark room. Furthermore I know how to think in terms of lighting and plan accordingly when filming for my Video Production class, and my Telecommunications Management class has taught me how to think in terms of running my own freelance business, which may very well be my entry point into the film and television industry. I remember the one-hour car ride from the airport to the small town of Muncie very well. comprises the state of Indiana. experiences in the industry I wish to work in. 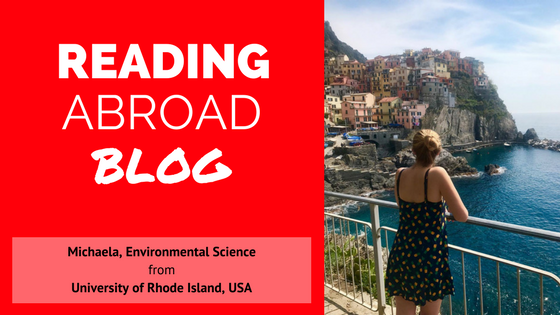 Studying aboard is something I have always wanted to do as it allowed me to mix both studying and travelling together. When this opportunity became available to study aboard for 1 year, I was beyond excited and was determined to make the most of it! 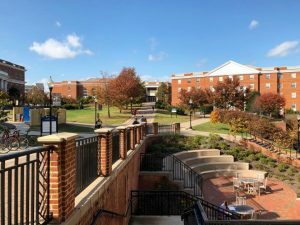 So, I headed to the University of Mary Washington, and I am loving every minute of it. 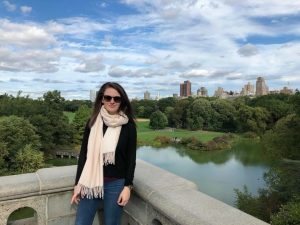 At first, I was expectedly apprehensive as I was heading into the unknown – I didn’t know anyone, was in a completely different country, and 3,000+ miles away from my family and friends. I arrived at Dulles Airport on 21st August and began my journey. All my anxious feelings were quickly overcome as soon as I landed, met my new housemates and saw where I’d be living for the next academic year. I decided to live in the International Living Community, also known as Framar House. This is a house of 20 students, and a mixture of both Americans and internationals. From living here, I was able to meet lots of new people and throw myself into all the activities going on. However, with a mixture of both jet lag and excitement, the first week was mostly a blur. There were lots of orientation events to attend, register for classes, meetings with the Center for International Education department (CIE) and fun events in the evenings. After the first week of initially settling in, getting used to ev erything, visiting the local historic and picturesque town of Fredericksburg, classes began. I was enrolled in their business college and had one or two classes per day. Getting used to a new education system, the accents and new classes and the new way of learning all proved more difficult than I had expected. But through already making close friends already with both housemates and classmates, and having understanding professors, I was able to adapt to this new way of studying. 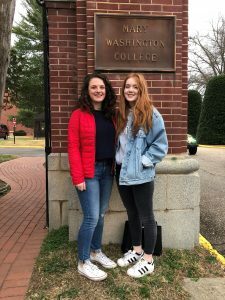 The first few weeks here at the University of Mary Washington, I was able to visit Washington DC and see all the wonderful memorials, monuments and museums (many of which are free which is all the better). My favourite part of DC was the Lincoln Memorial and the incredible view you get. 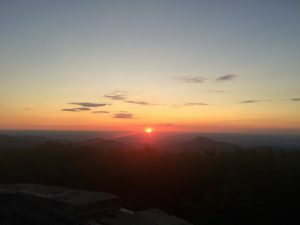 Myself and other internationals (Alice, Silvia and Luisa) all spontaneously decided to do a sunrise hike up a mountain in Shenandoah National Park, although it was incredibly early and freezing, the ultimate view was definitely worth it! One of the American guys in the house, John, also offered to take us to all the local historic sites within Fredericksburg, to educate us on the Civil War, and how Fredericksburg played a key part. Quite probably one of the most American things I could do but I have started a bucket list of all the American fast food places I go to that aren’t in the UK, and rating each one (how very American). So far, nothing can beat Chick-fil-a! These first few weeks being here has allowed me to grow independently, adapt to new situations, and travel. I have also become very close to 3 new friends who I know I will have for the rest of my life, so I am excited to see where the next year here will take me! 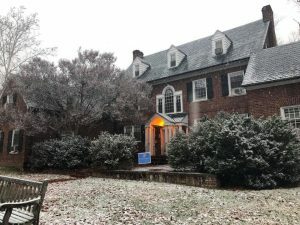 Since my past post, I can confirm that studying aboard at UMW was a superb choice! I have finally fully adjusted to all my classes and the American culture. The work structure was definitely different to the one back at Reading, which took time adapting. For instance, there are more lectures, assignments are due on a weekly basis and exams are taken every few weeks. Although the amount of work is clearly more intense, I have found that it isn’t as tough content wise. So, as long as you stay on top of it, you’ll be fine! Throughout these few months, I have managed to experience tons of lifelong memories and visit lots of new places, in Virginia and other states within this relatively short period of time. Some of these trips included going to NYC for Fall break with 5 others for 6 days. 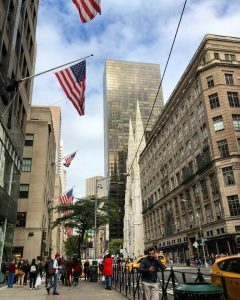 It was a fantastic experience because we got to see Brooklyn, Times Square, go up the Empire State Building to see the concrete jungle in its full glory, visit the MONA, go shopping on Saks 5th Avenue, walk around Central Park and Grand Central Station where I had flashbacks to my ‘Gossip Girl’ days! 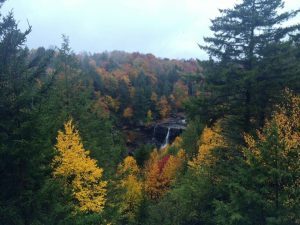 I also got the chance to visit West Virginia and see Blackwater Falls at the height of the fall season which truly was a picturesque experience. It was incredible to see a National Park with all the vibrant colour trees and see all the amazing views! It was a fairly long car journey (3 hours each way) but the scenery was absolutely worth it! Other activities included going to a soccer game in DC, going to King Dominion (a theme park) which had a fright night which was very spooky and fun! 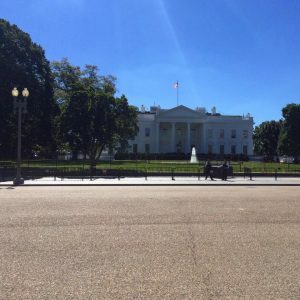 The University also arranged further trips for our house to visit DC, where I was able to visit several of the museums including the National history museum, the National Art Gallery and the American History museum. I also visited Richmond, went apple picking and went to a shooting range and shot a gun (which did terrify me). Myself and 3 of the internationals living in Framar House got invited to spend Thanksgiving break in November with one of our friends Christian. We spent a lot of time consuming wine with his family, visiting the Blue Ridge Mountains, meeting all the immensely friendly family members and consuming lots of scrumptious food. Quite frankly I’ve never been so excited to see home cooked food! The rest of the fall semester was spent focusing on my studies, as finals were looming and lots of assignments were due. Finals were obviously stressful as they are back home, but I felt the added pressure here since we didn’t get any time off to study for them. However, I got through this period with knowing that I was heading back to NYC to see it at Christmas. I adore Christmas, so getting this opportunity during this season was a dream come true! 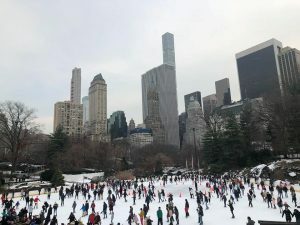 So, myself, Alice, Luisa and Silvia, headed to NYC on the 16th December and used these few days away to spend quality time together, relax and explore more of Manhattan. 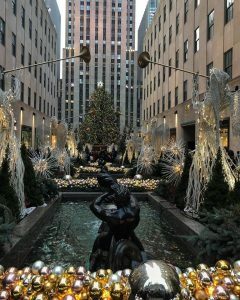 We endlessly strolled around Central Park in the snow, went to see Wicked, visited far too many coffee shops and saw all the sensational decorations at Rockefeller. It was here I additionally had to say my farewells to these girls since they were only studying at UMW for 1 semester which was very emotional since I have spent every day of the last 4 months with them and shared some tremendous memories. However, we have already planned to visit one another next summer, so I cannot wait to see them all and visit Italy and Germany. Currently I am sat back home in the UK as I flew back for the Christmas festivities and the chance to see all my family. Being back here has allowed me to reflect on these amazing past 4 months, through all the great opportunities I got to partake in and knowing that I have grown in regard to confidence, independence and adaptability. Although I am so grateful to be with my family, I am consumed with a sense of excitement to fly back out for the spring semester and see what new adventures I get up to! 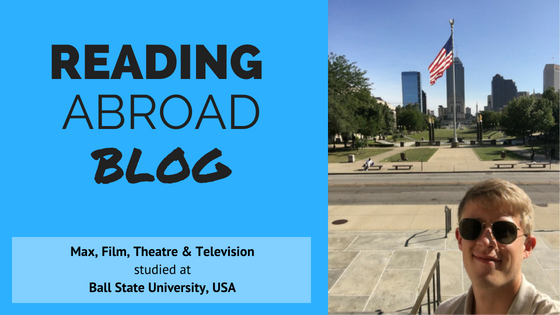 You might be planning already for your family to visit you while you are studying abroad at Reading. If you need some ideas for what to do with them, here’s what Collin got up to when his family visited! One of the great things about Reading is that it provides an excellent place for family to come and visit while studying at the University. 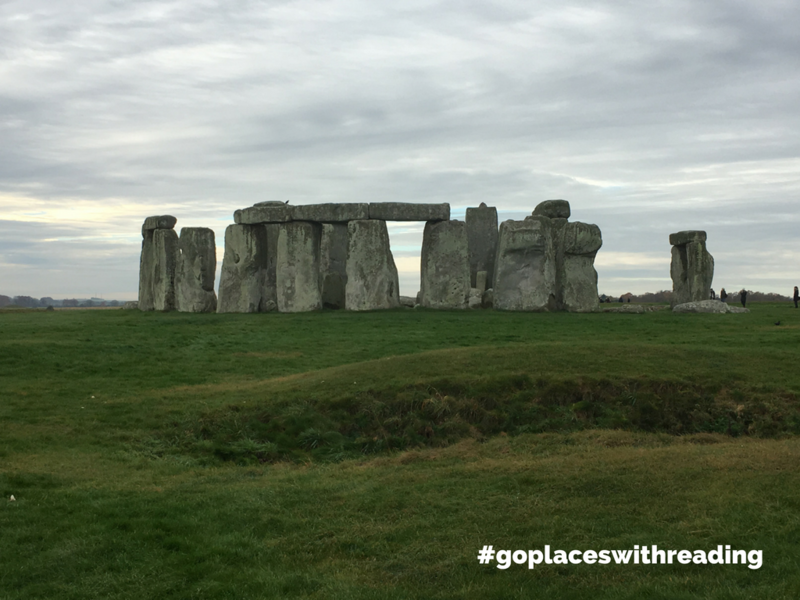 Being so close to London my family was able to fly in during Thanksgiving break to come explore what England has to offer. Being their first time to Europe I was very excited to show them around. The first item on the agenda was to explore the town of Reading. The whole family was keen on doing some shopping, so the Oracle center provided the perfect opportunity to cross that off the list. The next item on the list was Stonehenge. Stonehenge is only about an hour south of Reading, easily accessible by car. It was a wonderful experience and very informational. Stonehenge is one of those things that you have to experience first hand to truly appreciate the beauty and history it has to offer. On the same day, we visited the town of Salisbury, a small medieval cathedral city with tons of shops and restaurants. The next couple days were spent in downtown London seeing places like Buckingham Palace, the London Eye, and St. Paul’s Cathedral. There are so many other exciting places to see in England that are close to Reading. Other excellent places to visit within a short distance are Oxford and Bath. Oxford is home to the world famous University as well as a city with unique shops. It is quite a pleasant sight and definitely a must see for anyone travelling to England. Bath is another must-see city home to the Roman baths and museum as well as a Christmas market in the beginning of the Christmas season. Overall, it was an awesome experience having my family come into town and Reading provided the perfect opportunity to make that happen. NB: for students joining us in January (and those continuing from Autumn 2017), we’ll be organising a Study Abroad Programme Trip to Stonehenge and Winchester, which will take place on Saturday 10 March 2018. More details will follow in February 2018. Save the date! Reading is proud to have a diverse community of students and staff. 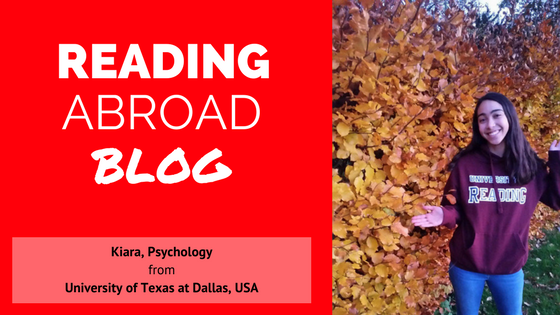 Coming from a diverse campus at University of Texas at Dallas, Kiara was able to get involved with activities to celebrate this diversity while a member of the Study Abroad Programme at the University of Reading! I am racially ambiguous. Being multiracial is a huge part of my identity. It’s kind of hard for it not to be a huge part of who I am, considering it generally means I look different from my peers–regardless of wherever in the world I happen to be. I really do love being multiracial, and I wouldn’t trade it for anything. Growing up in a multiracial family meant being surrounded by diversity all the time. The older I got, the more I realized that diversity is not always the norm; moreover, diversity is something to be celebrated and appreciated. Diversity is so near and dear to me that it played into my decision to attend my home university, The University of Texas at Dallas. My university has been ranked by U.S. News as one of the nation’s most diverse campuses. I was so fortunate to become a part a community that values diversity in all forms. For example, administrative departments like the International Center, the Galerstein Gender Center, and the Multicultural Center are a few great resources that schedule many popular student functions throughout the school year. In my second year at UTD, the Multicultural Center founded a student group specifically by multiracial students for multiracial students. After spending a year on this committee, I left to study abroad at the University of Reading. When I got to campus, I was in awe of how much Reading has to offer their students. There is a student organization for anything you could think of: surfing, quidditch, archery, Bollywood, Disney, and the list goes on and on. I had no idea where to begin! As luck would have it, shortly after I got to campus, I got an email from RUSU’s [Reading University Students’ Union] Diversity Officer. She was promoting Black History Month and a student committee dedicated to celebrating the diversity that exists on campus. I jumped at the opportunity to join the One World Committee! In the initial interest meeting, we had representation from seven countries. It was incredible to see such a large, diverse turnout, despite the university being primarily white, British students. We began to plan the first event of the school year–an event to showcase how cultures from around the world celebrate winter holidays. The event was scheduled for early December, and I was really excited to see how everything turned out. I’ll be working the welcome booth, but other Reading students from all across the globe were setting up booths to show how they celebrate Christmas, New Year’s Eve, and other winter holidays with traditions, clothing, and food. I mean, who doesn’t love cultural learning and free food? As part of the One World Committee, I also had the opportunity to help design a video campaign to promote One World Committee and its events. I even get to be in the video! The video is still in the works, but keep your eyes out on RUSU’s social media pages for updates! Even though I am only at Reading for the fall, I am grateful to have had the opportunity to meet and work with some great people. I am so happy to have found a community that values diversity and works to promote it. I’ve enjoyed my time working with the One World Committee and I cannot wait to see how it grows and develops (even if it is via social media). One family, one people, one world, one love! NB: for more information about how diversity is acknowledged and celebrated at the University of Reading, please see https://www.reading.ac.uk/diversity/. For more information about the One World campaign Kiara was involved with, please see https://www.rusu.co.uk/campaigns/2017-18/one-world-reading/. 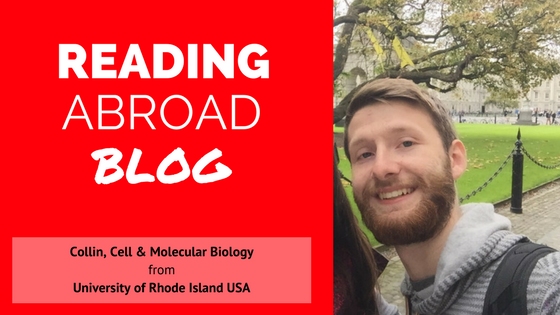 There’s a special something about the University of Reading and the town of Reading that really appealed to Collin, who joined us on the Study Abroad Programme from the University of Rhode Island. Read on to get a taste of that aesthetic! Coming from a small New England town in the United States, I grew up appreciating nature for all the beauty it has to offer. At first glance I was a little skeptical about the urban location of the University of Reading and how many cities these days are more focused on buildings than plants and animals. It only took me a few hours to realize the University of Reading has both the benefits of an urban setting while still keeping its natural roots. It’s amazing how the University is able to combine modern buildings, historical buildings, and a vast amount of biodiversity all on the same campus. It is safe to say Reading has surpassed my expectations and continues to surprise me. Another great thing about Reading is the downtown area. 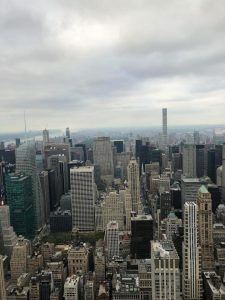 There are so many stores, restaurants, and events that its almost impossible to visit them all even though it is only about a 10-minute bus ride. The streets have a very old-town English feel to them, even though they are stocked with all the latest stores (many of which can only be found in England). It makes for a great place to adventure with friends for shopping and other activities such as getting coffee or tea. There is an overabundance of different types of restaurants with food from all over the world. Its quite remarkable how much culture and diversity they have jammed into one small city. There’s also numerous festivals that take place during the year like the Oktoberfest celebration that is held in town every year. During the winter term they even have the town decorated with Christmas decorations with a large tree in the town center. It is a very beautiful setup and rivals even some of the larger European cities. One major stereotype about American universities is the concept of a shared dorm room. For many students, living in these halls acts as a rite of passage. I was lucky back when I was a “fresher” (British English has grown on me) to have had a residence hall that was a little atypical—in the best possible way. My home university, The University of Texas at Dallas, became an undergraduate institution in 1991, and didn’t have residence halls on campus until the mid-2000s. When I moved in, I was blessed with a state of the art flat: my own sink, countertop space, and private bedroom despite sharing the flat with two others. Instead of sharing showers and toilets with the entire floor, I only had to share with my flatmates. It was a pretty sweet gig. Living in such close proximity to other students stimulated the quick formation of friendships. By the end of the year, I had realized that my closest friends were the ones whom I saw daily—at dinnertime. Sharing meals was such a social experience. Everybody needs to eat, and it was all the better to share that time with friends. When choosing my accommodations at Reading, I had to think long and hard about what I valued most in a hall: proximity to food and proximity to campus. Thus, I ended up in St. Pat’s! Though it ended up not being the closest hall to my classes, I grew to appreciate the daily walk past the lake. The lake and Harris Gardens quickly became some of my favorite places on campus. They’re absolutely beautiful in the fall! Alas, food! St. Pat’s is situated right next to “Shams,” as I’ve grown to call the Shamrock Cafe. Open five days a week, Shams proved to be a convenient place to catch a bite with the other students from my block. In no time at all, I had forged friendships with students from Wales, England, France, and China. Over our shared dinners, we learned about one another’s school systems, families, and vernaculars, just to name a few things. Despite being here for three months, the number of differences in British and American English still surprises me. Moreover, I did not realize that regional slang and accents were so different in the UK! Despite the US being so much bigger, there is not nearly as much variation in accent from region to region. You’ll find a little bit of “y’all” with a southern drawl, but it’s the difference is not as stark as the difference between Welsh and London slang. My flatmates and I have been through a lot together. Nothing brings you together quite like three 1AM fire drills over the span of two weeks. Looking back on it, we all laugh at how routine it became. We’ve also had some good nights out at the Union. It’s always more fun with a group of friends! Before I leave, we are planning to do a Secret Santa event. It’ll be funny to see what kinds of gifts are exchanged after a few months of knowing one another. I’m really happy with my choice in hall. Food facilitated friendships tend to be some of the best. The people I’ve met are hilarious and a lot of fun to be around. Despite the fact that they sometimes leave the kitchen a mess, I love them nonetheless. I look forward to keeping in touch with them after I return to the USA! 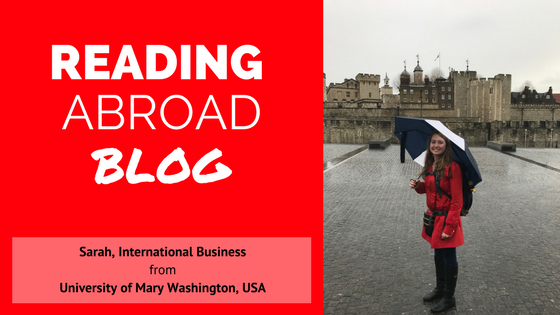 As the semester is winding down and examination preparation is in its midst, I am taking a moment to reflect on what has happened in the past three months of my abroad experience. A lot has happened and it has been hectic, joyful, and quite the learning experience. Let me tell you, it does rain. And yes, take your umbrella with you. At University of Reading I am enrolled in modules in the Henley Business School. 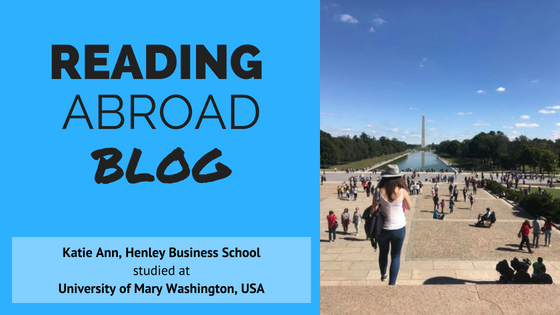 I am an International Business major and Henley’s excellence in emphasizing international study was a real draw for me! Studying at a university in the United Kingdom was definitely a transition. It places much more importance on self-learning than traditional American institutions. In all honesty, I did not know how to handle all my “free” time when I initially began my modules! However, I soon began to smoothly transition to UK study habits and joined clubs to fill my time. One club that was extremely beneficial to my time abroad was the Erasmus Society. The Erasmus Society gave me the opportunity to meet and travel with international students and others who were interested in study abroad. It was a welcoming and friendly community which allowed me to create long lasting friendships while exploring parts of the UK’s most interesting landmarks and cities. Speaking of traveling, the UK has allowed me to experience some of the most memorable travel experiences. I have travelled by train, plane, and bus exploring the UK. Whether the trips were planned by the amazing Erasmus & Study Abroad office, the Erasmus Society, or my own personal trip advising, I have seen and done things that I will cherish for a lifetime. One of my favourite memories while traveling the UK was getting to see the Crown jewels at the Tower of London. I am a real fan of the “The Crown” on Netflix so getting to experience the monarchy’s history was a real treat! Even though navigating the Tube did take some getting use to! 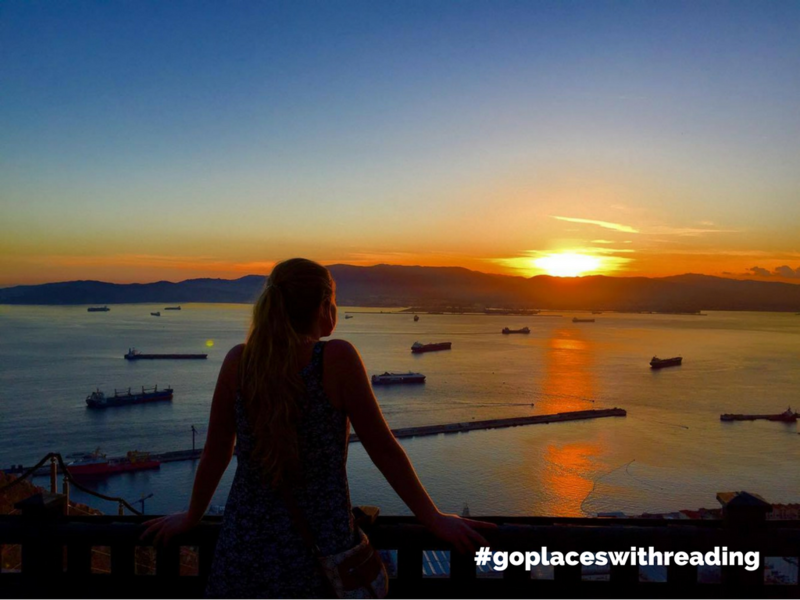 Getting to go abroad was an amazing experience and it cannot be summed up in nearly one post. I am glad I chose to come the United Kingdom as my abroad destination and even happier that I chose the University of Reading as my abroad university! 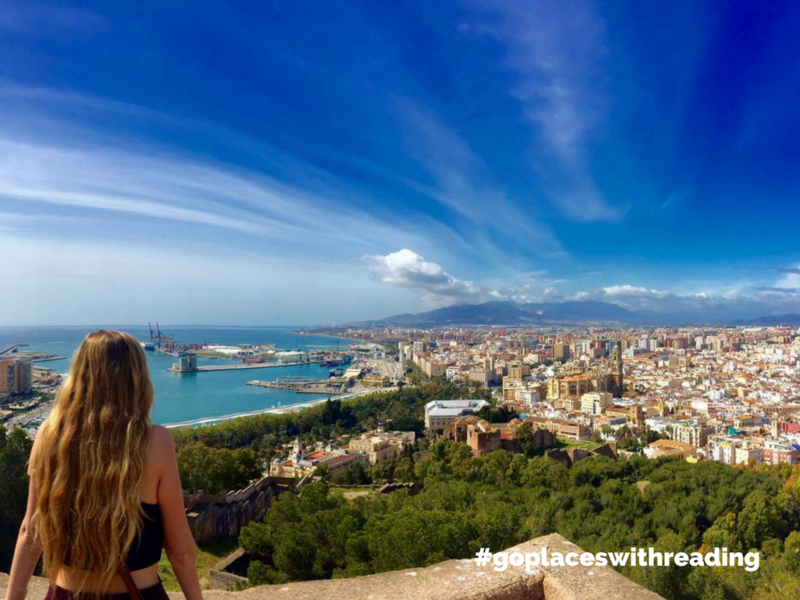 Join Michaela as she takes a break from her studies at Easter and leaves her home away from home at Reading to explore more of Europe! When you study abroad at somewhere like the University of Reading, you inadvertently discover a home away from home. At the same time, you are also inspired to leave that home and explore. Having come from a family who has encouraged me to see the world, I took full advantage of the University of Reading’s Easter Break between spring and summer term. After my last class that Friday, I headed to London Gatwick with my weekend duffle bag to start my 24 day-long trip in Madrid. Through the Erasmus programme, I found travel partners as well as places to stay along my trip since my new friends from school live in all different countries. 14 cities, 6 countries, and 1 British Territory later, I had felt a range of emotions. Accomplished for surviving various metros in foreign languages by myself, bliss from eating delicious food, exhausting from overnight trains and endless walking, and above everything else: appreciation. If it wasn’t for this school and in part the funding from my blog scholarship, I wouldn’t have pushed myself to see so much. This school has a unique ability to help you surface your passions and to realize everything you’re already capable of, which is something every student can benefit from. Not only did Reading give me the courage and resources to explore so much, but it also gave me a place to miss. By the end of my travels, I started to feel homesick for Reading and the people it brings together.